Each Page Builder area contains a combo box which defines the “scope” of the content, i.e. the pages in the store front under which the content will be shown. Every item in the scope combo box is responsible for a page or group of pages. There are some rules which determine how this scoping is applied. A page could “inherit” its contents from an upper scope, which allows you to create block configuration that apply to many pages. This works similar to opencart layouts, but is much more configurable. There are two types of scopes – general and single page scopes. As the names suggest, the general scope is responsible for a group of pages. For example, if you want to want a footer to be displayed all over the site, it would be ridiculous to assign it to every single page. Instead, you would enter the footer area, choose ‘GLOBAL’ scope, assign rows and blocks and you’re done – the footer is globally displayed. Later you decide that you would like a specific footer for the home page. Just enter the footer area, choose the ‘home’ scope, assign content and save it – that’s all, the home page will have a different footer. 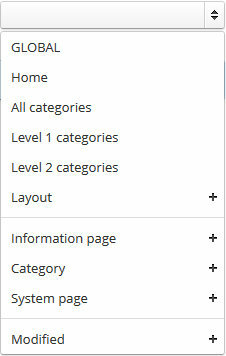 Category, information and system page stand for single page scopes. 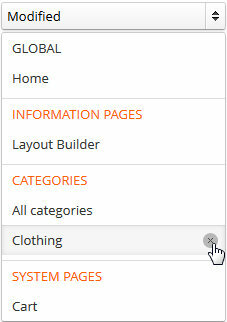 If you choose one and assign content blocks to it, they will be displayed on this particular page only. After you save the area setting, a record for the current scope is created. An item will appear under the ‘Modified’ submenu. You can use this menu the review the saved scopes or to remove some. In general, scopes are intuitive to use. The only non-trivial thing is using layouts as scopes. If you want more detailed information about the scope mechanism, proceed to next section.